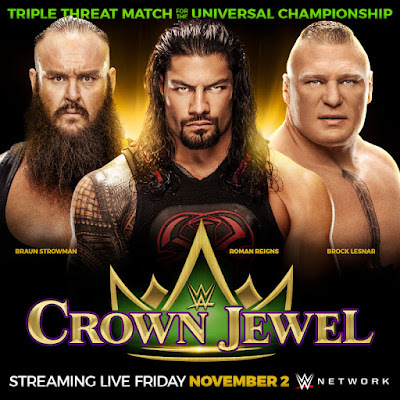 The Saudi General Sports Authority in partnership with WWE will present the Crown Jewel at the King Fahd International Stadium in Riyadh, Saudi Arabia on November 2, including a Universal Championship Triple Threat match featuring Roman Reigns, Brock Lesnar and Braun Strowman, and the first-ever WWE World Cup tournament to determine the best in the world. General Sports Authority of Saudi Arabia Chairman His Excellency Turki Al Sheikh, WWE Chairman & CEO Vince McMahon and the Kingdom of Saudi Arabia, invite the world to celebrate this signature event. Following the sold-out Greatest Royal Rumble in April, this is the second event as part of a long-term partnership between WWE and the Kingdom of Saudi Arabia. The Crown Jewel will stream live on WWE Network and be available on pay-per-view outside of the Middle East. Ticket availability and regional broadcast information will be announced in the coming weeks.